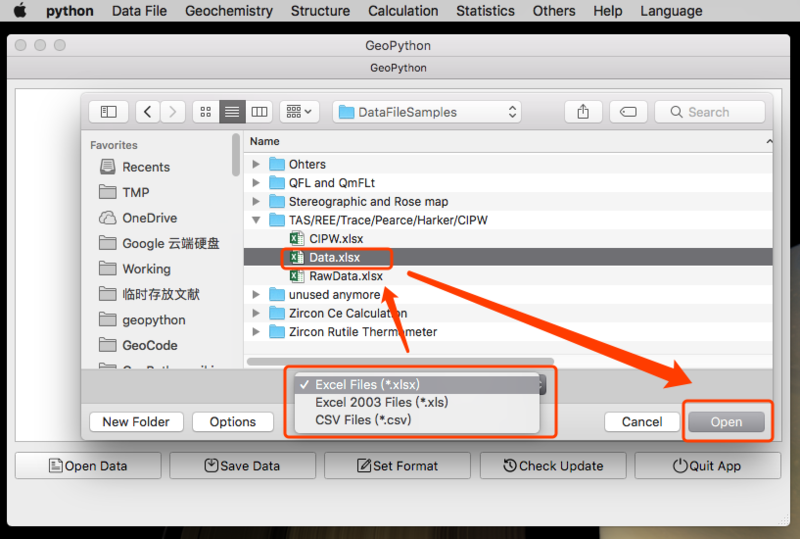 To start a plot or calculation, raw data file should be imported to GeoPyTool first. 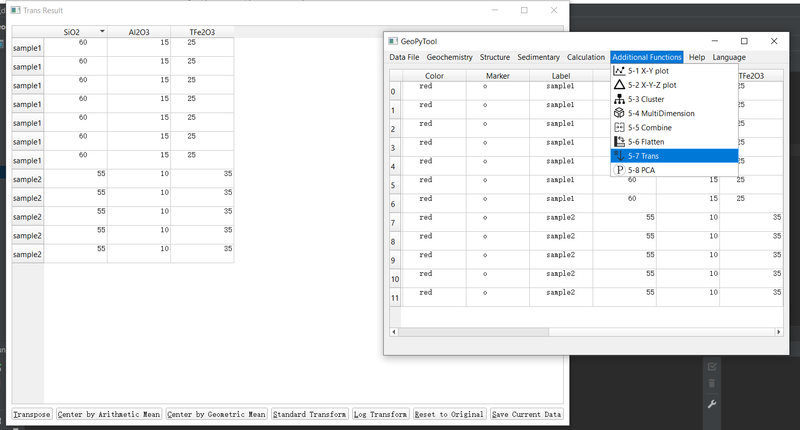 The Data file can be Xlsx/Xls or CSV. Unit of Oxide Items (such as SiO2, TiO2, Al2O3, Fe2O3, FeO, MnO, MgO, CaO Na2O, K2O, P2O5, LOI, Total, etc )is weight percent (wt%). But Make Sure to follow the format in data templates. Do not contain the % in the used data files! Unit of other Elements Items (such as Li, Be, Sc, V, Cr, Co, Ni, Cu, Zn, Ga, Rb, Sr, Y, Zr, Nb, Cs, Ba, La, Ce, Pr, Nd, Sm, Eu, Gd, Tb, Dy, Ho, Er, Tm, Yb, Lu, Hf, Ta, Tl, Pb, Th, U) is ppm. 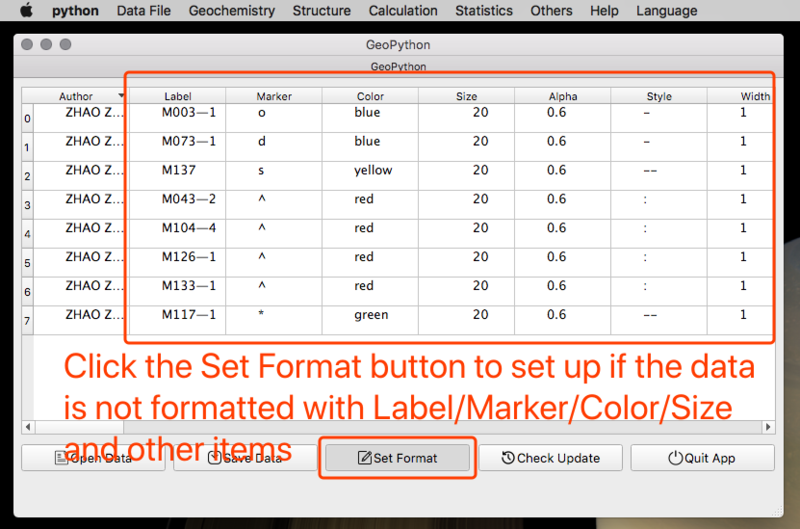 If there is no setting up information such as the Label/Color/Marker/Style/Alpha/Width, you need to click on the Set Format button to add these items and make modification by yourself. 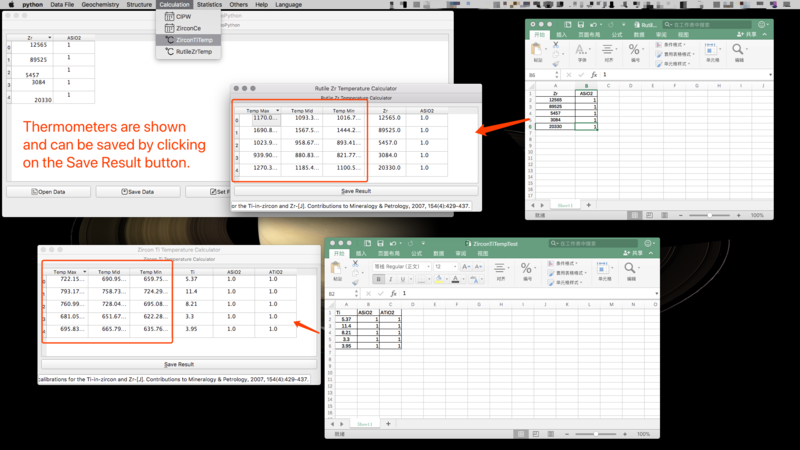 Besides these seven items, the other columns in your data MUST ALL be number values! Label can be set to any character，word or phrase. Color can only be chosen from following words: 'blue','green','red','cyan','magenta','yellow','black','white'. These three are number values. The unit used for Size and Width is pt. Size normally should be larger than '10', and Width usually is '1'. Alpha can be set from '0' to '1', for example, setting Alpha as '0.4' means 40% transparency. these two are slightly more complicated and can be set as the contents of the following lists. 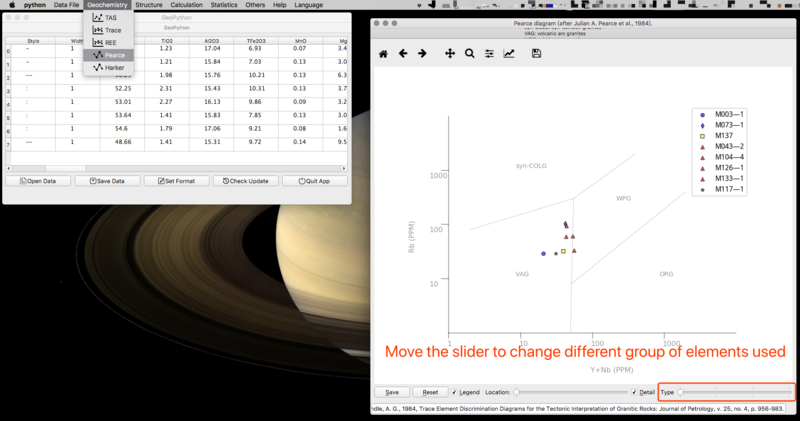 All generated figures contain a menu bar on its top, which can be used to adjust the axises and title. 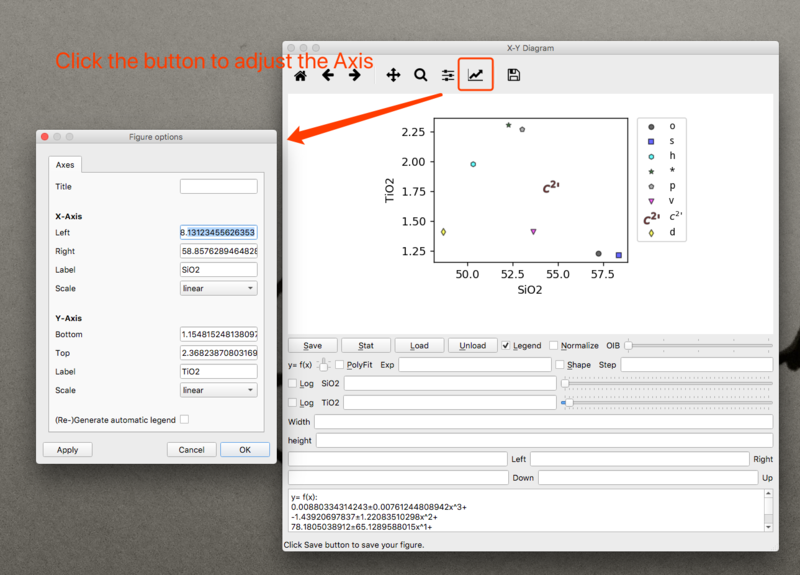 After setting up, you can just click to use the function you need. These functions are quite commonly used and the details are shown as the picture below. Pearce Diagram just use some trace elements and is also quite easy to know how to use. 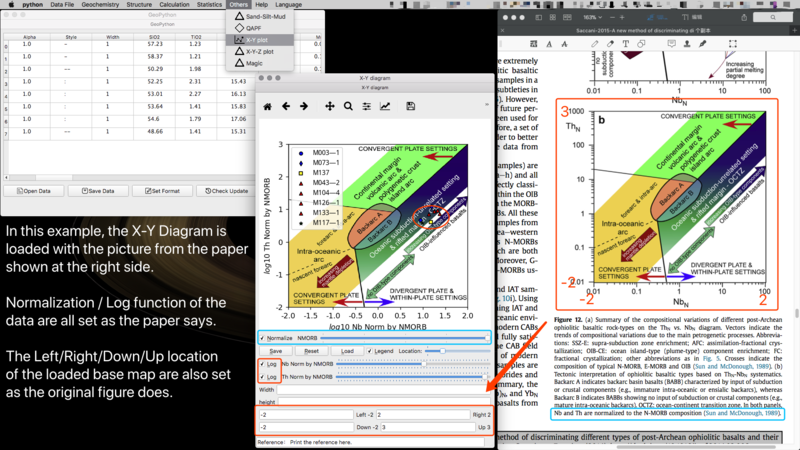 Harker Diagram is a little bit complicated. Both the X and Y items used for the picture can be selectable by the slider. These two diagrams are very easy. But you must find the right data file used for them to import. 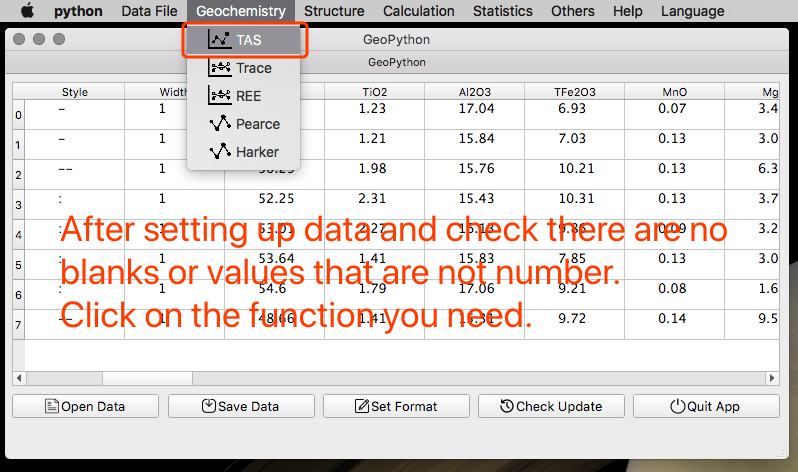 Remind to set up data, then you can run these two functions. 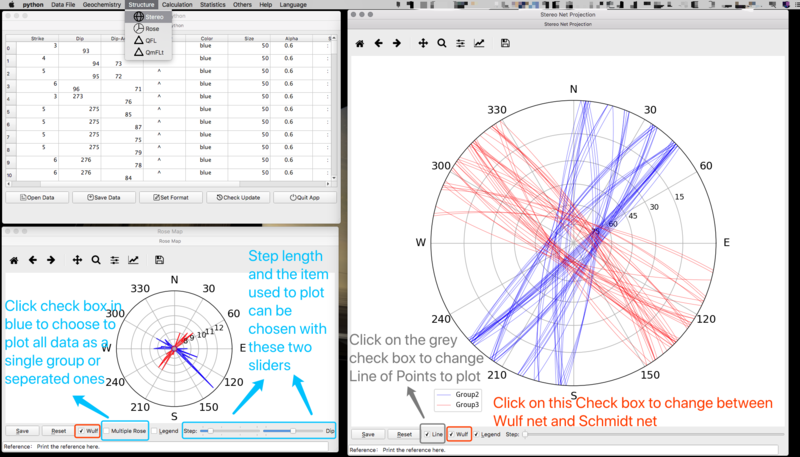 Wulf or Schmidt Net can be chosen, and so is to use Lines or Points on the generated diagram. 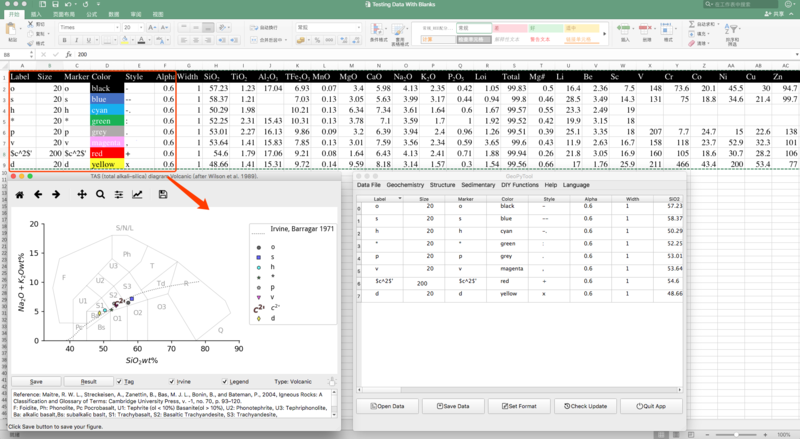 In the Rose Map function, all data in one data files can be treated as a single group of data to draw Rose Map, and can also be treated as seperated teams to compare the Rose Map from each other. The step of the Rose Map can be set by slider. And so does the items chosen to use in the Rose Map. Dip/Dip-Angle/Strike are all available. Notice that the first Letters must be in UPPER case. The data file used here is quite complicated. Please follow the guidance shown in the picture below. 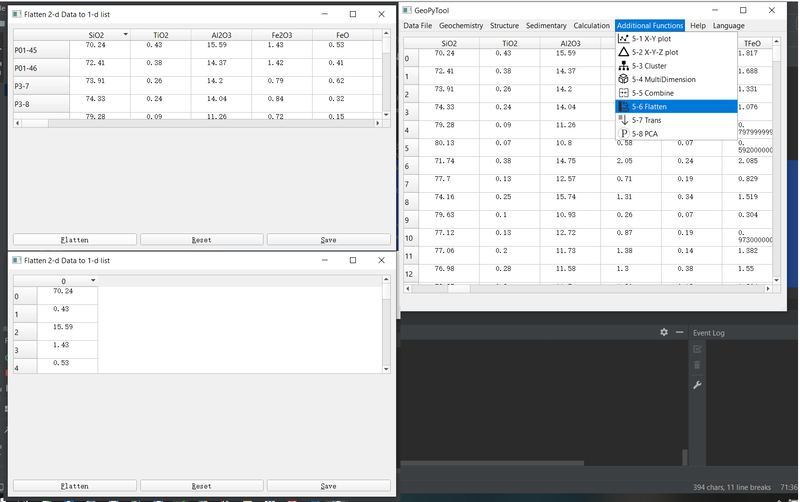 Alarm！ This function has been totally rewritten and the old Data File for the older version can not be used directly to the new version function! 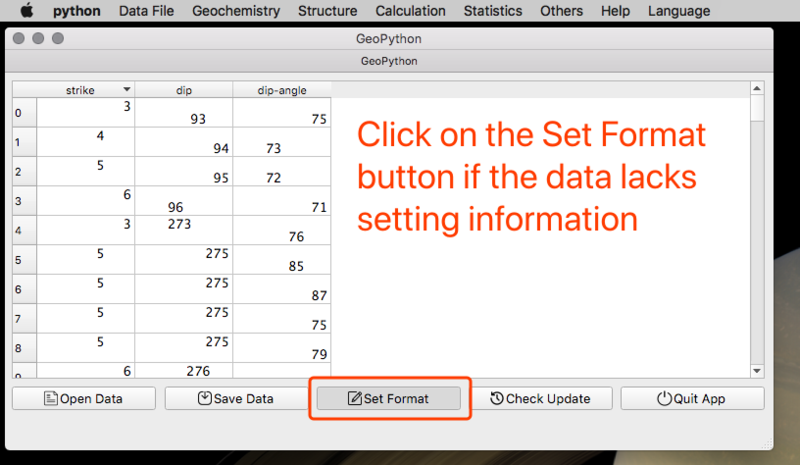 Please Download the latest Data File Templates from https://github.com/GeoPyTool/GeoPyTool/blob/master/DataFileSamples/Zircon%20Ce%20Calculation/ZirconCe.xlsx . 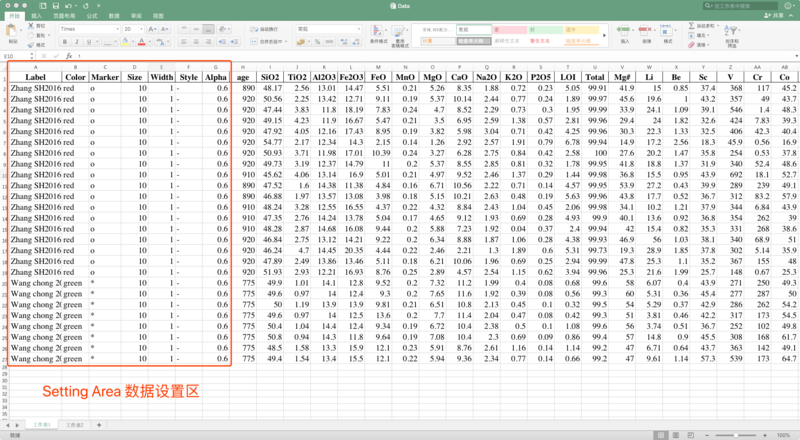 In the template data file for this calculation, the row with the Base symbol needs to be filled with the bulk REE data, and the zircon rows and Label column is where the REE data is input. The Zr value for zircon should be set as the “constant” 497555. 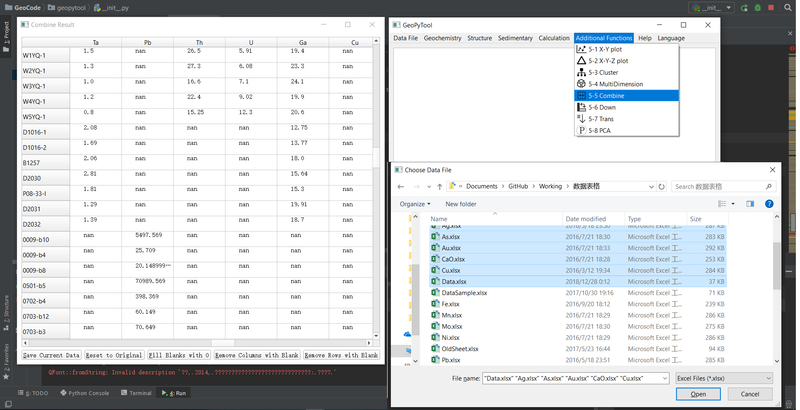 Please Delete all unused elements and only leave the data to fit and calculate! These two function are super easy. Notice the ASiO2 and ATiO2 here are the Activity of these two components. 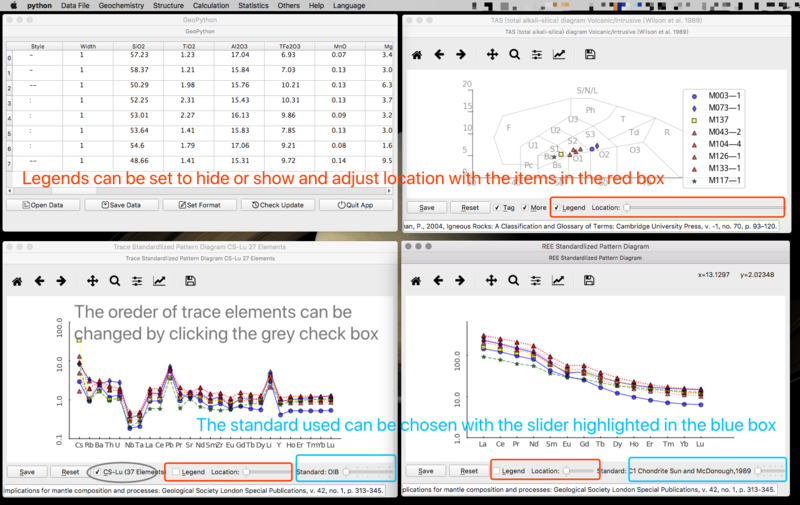 This function allows users to load any picture from any articles as a base map to plot on. But you must understand the original plot first and know the mathematical setting of it. 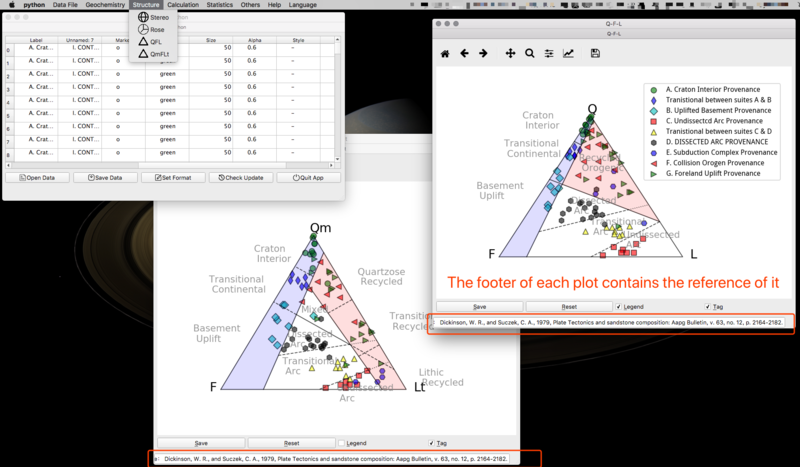 So you can set up the right format in your plot. For example, as the picture below shown, the original diagram used Nb and Th, normalized by N-MORB(Sun and McDonough 1989), and then used the Log function of these two items. So we do the same setting up as shown by the picture. 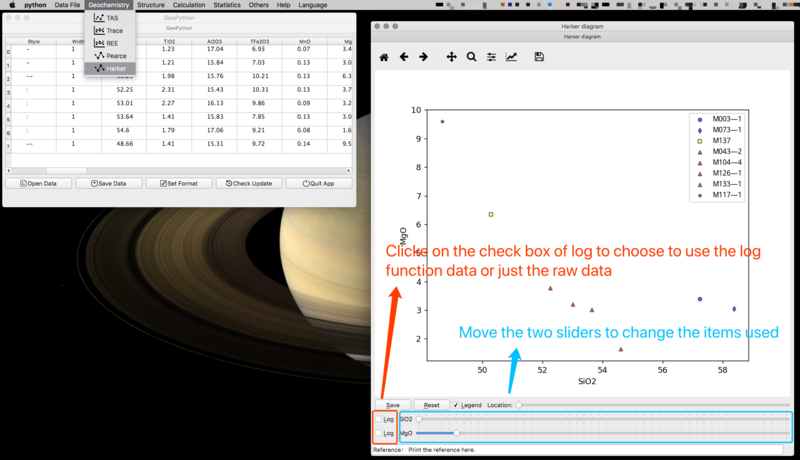 The Left/Right/Down/Up limit of the original diagram are 0.01/100/0.01/1000, so we need to use the Log function and find out that we should set the Left/Right/Down/Up limit to be -2/2/-2/3. If you can not understand why, please take a rest and good bye.